Segundo de ChomÃ³n belonged to a generation of nameless film directors; his films were cast with nameless stars. With film only just stumbling into the 20th century, cinema was still a credit-less art form. No title sequence, just an abrupt ‘Fin’. It was the studios that supplied a name and an identity. The iconic Pathé cockerel repeatedly pops up mid-action while de ChomÃ³n’s name is nowhere to be found. Yet de ChomÃ³n is not forgotten; by sifting and piecing together film history, his name has become attached to an impressive filmography of tableaux and film fragments, celebrated at this year’s New York Film Festival. The programme of films – some broken and some complete – was held together by early cinema specialist and playful commentator Tom Gunning. Introducing the films in an entertaining and pleasingly unobtrusive manner, Gunning rejoiced in de ChomÃ³n’s ‘Spanish sense of total weirdness’, speculating that perhaps a young BuÃ±uel or DalÃ­ might have settled down to his Andalucian Superstition (1912) years before they started work on their Chien andalou (1929). There are many similarities between the works, although there is a difference in authorial temperament; Gunning painted de ChomÃ³n as less of the artistic, controversial auteur and more of a technician. He was working at the very beginning of film when technology was being mastered and explored. The key was not making a statement, but rather entertaining the audience and experimenting with ‘what the camera could do’. His early films show a fairly straightforward approach. A historical reproduction of Spanish resistance to Napoleon was a static affair with muddled crowd scenes and, as Gunning amusingly pointed out, ‘dead bodies finding comfortable ways to die’. Next came a slapstick chase film, which saw a newly rich man advertising for a wife and then beating a hasty retreat from swarms of pushy females. Again the camera was positioned stock-still while the action rushed in and out of frame but the charming conceit obviously took off and many variations were made, most famously Buster Keaton’s Seven Chances (1925). Gunning was quick to point out that in early cinema ‘ripping each other off was business’. Indeed, I also spotted similarities between de ChomÃ³n’s Electric Hotel (1908) and Keaton’s Electric House (1922), which both show electrical gadgets wreaking havoc on unsuspecting residents. Using a beautiful range of effects, de ChomÃ³n creates gizmos – from a mechanised letter-writer to an automatic undresser – to rival those of Keaton’s glorious silent comedy. It was with such later films and in particular, Ah la barbe (1905), that the NYFF screening took a decided turn for the surreal. As Gunning said of the film, ‘there is no plot, just plain weirdness’. Seated in front of a full-length mirror, a man lathers up and begins to shave, but is repeatedly thwarted in his attempts as his reflection morphs into strange, animal-like visages. Increasingly bemused and frustrated, the actor turns to camera to pull puzzled, exasperated faces. These expressive facial asides highlight the enchanting theatricality running through de ChomÃ³n’s work. Vaudeville theatre is key and a major contributor to the bizarreness of his visions. One of his films even takes place inside a miniature children’s theatre with wrestling and fencing puppets playing out the action. Magic tricks are ever-present. A magician oversees the action in Les cents trucs (1906), turning ballerinas into clowns and back again; in The King of the Dollars (1905), a hand deftly plays with gold coins, creating optical illusions before our eyes; and in The Unseizable Pickpocket (1908), a crafty thief turns into a slither of fabric in his attempt to evade the law. De ChomÃ³n was himself a magician with his camera work, using editing and stop-motion techniques that we would associate with 21st-century expertise. For his 1907 film, Ki Ri Ki Acrobats, de ChomÃ³n shot actors lying in various formations on a black sheet using an overhead camera. 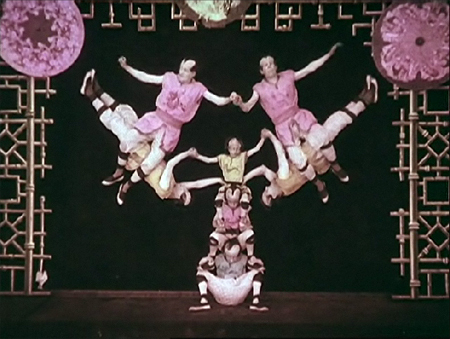 Through this trick in perspective, the acrobats appear to be performing gravity-defying gymnastics. The funniest routine involves a tiny acrobat straining and holding up his huge colleagues on a narrow plank of wood. The exotic troupe of ‘Japanese’ performers, the physical comedy and the optical illusions are pure vaudeville. According to Gunning, in addition to this theatricality, the other key contributor to the weirdness of de ChomÃ³n was his Spanishness. The Andalucian Superstition takes its plot from a traditional Spanish folk tale; a woman seethes with jealousy on seeing her lover talking to a Romani woman and dreams that her lover is captured by gypsies. The dream sequence is worthy of Hitchcock’s 1945 Spellbound (giving further weight to the idea that DalÃ­, who worked on the film, did see de ChomÃ³n! ), beginning with the camera pulling up to a close-up shot of the jealous woman’s face, all haunted eyes and furrowed brow. The following interlude with its gypsy cave of strange bottled creatures is a strange, fantastical marvel. Again de ChomÃ³n seems light years ahead of what one might expect; the use of psychology and odd surreal visions seems like it could belong to a much later period of film history. This enchanting use of folkloric material also shines through in The Red Spectre (1907). A nonsensical work that roughly plots the rivalry between a male and female magician (played by de ChomÃ³n’s wife), the repeated images of skeletons and fire seem like symbols from a traditional folk tale. Reading between the lines, the film reveals a pre-occupation with the manipulation of the female image. Tiny women appear trapped in glass bottles and an image of a woman appears on a box composed of moveable segments. They are images that linger in your mind, playing out in strange colourised tones. Interestingly, de ChomÃ³n started out working as a colouriser and would end his career in a similar technical role, working as a cameraman for the Italian director Pastrone, and as one of the many technicians on Napoleon (1927). He may not be remembered like a Keaton, a DalÃ­ or a Hitchcock, or even like his contemporary MéliÃ¨s, but his work as a director is imaginative and extraordinary and deserves a credit at last. Segundo de ChomÃ³n’s Metempsychosis screens at Tate Modern in London on Friday 3 December as part of the 3rd Fashion in Film Festival.